Hendersonville, Tennessee has hills, valleys, watersheds and hollers, dirt roads, highways and interstates, temperatures that range from less than 0° to more than 110°, salted roads in the winter, and a whole bunch of assorted bumps and holes which will wear out your suspension and brakes. Most of our customers here in Hendersonville know exactly what is wearing out their shocks , brakes and suspension systems. It is the roads and driveways leading to their house! Hendersonville Muffler Company has been repairing brakes, shocks, ball joints, tie-rods, steering racks and steering boxes, steering dampeners, power steering pumps and hoses and the more modern electronically controlled suspension systems for years here in Hendersonville, Tennessee. We are the best place in Hendersonville, Tennessee to have your suspension system or braking system repaired. One of the things that always made us laugh is men who will tell you “I don’t know how to work on cars but I do my own brakes”. 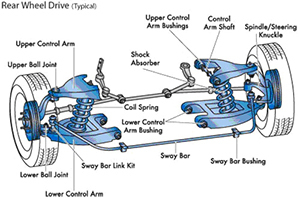 Mistakes in the suspension system and braking system can cause serious accidents. With the introduction of Anti-lock braking systems and electronic suspension systems in and trucks brake and suspension repairs are best left to the professional mechanics at Hendersonville Muffler Company in Gallatin, Tennessee.